As reported in The Evolving Urban Form: London, last July the Greater London Authority (GLA), located inside the Green Belt, grew strongly from 2001 to 2011, though remains well below its peak estimated population in 1939. 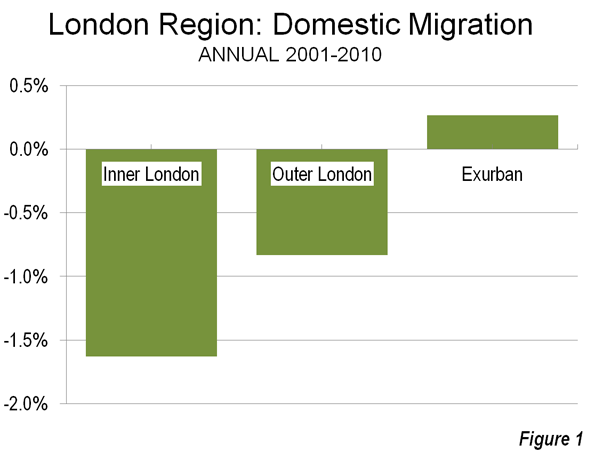 Substantial domestic migration from the core area to the exurbs was a major contributor to their growth during between 2000 and 2010 (Figure 1). Obviously, with all that growth and all that domestic out-migration, international migration had to be driving the population growth in the GLA. The British Broadcasting Corportation (BBC) confirms that, reporting that, for the first time "white British" residents of GLA represent a minority of the population. At 45 percent, this population segment is down from 58 percent in 2011. Whites, however, remain a majority, with more than 1.3 who do not consider themselves British, according to the 2011 census data. The combined white population is nearly 60 percent of the GLA total. The table below provides the ethnic data as reported by the Office for National Statistics. Submitted by jasaseoku on Thu, 05/21/2015 - 02:27. Submitted by jasaseoku on Thu, 05/21/2015 - 02:23. Submitted by mobi on Wed, 05/20/2015 - 02:04. Submitted by VickiHuter on Wed, 05/13/2015 - 02:12. Submitted by david watson on Mon, 05/11/2015 - 01:04. Submitted by david watson on Fri, 05/08/2015 - 14:17. Submitted by zac1 on Tue, 05/05/2015 - 07:04. Submitted by david watson on Wed, 04/22/2015 - 14:12. Submitted by sidra878 on Fri, 08/29/2014 - 09:25.